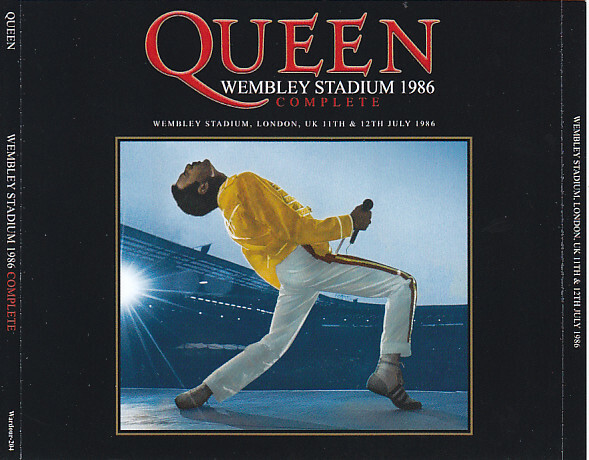 Recorded: Live at Wembley Stadium, London England July 11th & 12th 1986. Comments: Two complete shows from the Magic tour in 1986. The last Queen tour with Freddie. The 2nd. release from Japanese Wardour label from this two concerts. 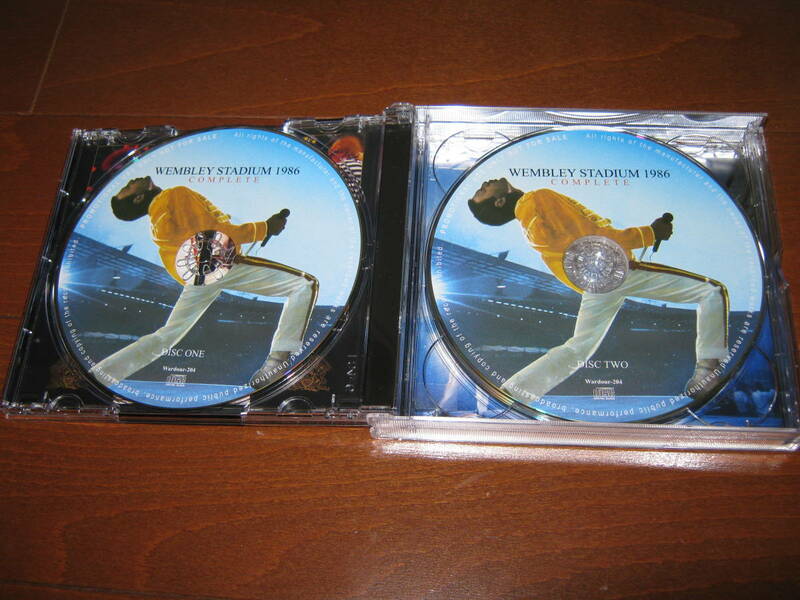 So you can call this a re-release of the 2012 release "Wembley Stadium 1986" (Wardour 096). So this version, is more than less a '30 year's anniversary edition'. I don't have this release, so I'm not sure if the sound quality is different than on the first release. Both this concert's are released officially on 2dvd's, and one 2cd from the July 12th. concert. It was first released officially on a VHS video in 1987. The video was from the 12th. show, but didn't included the full show. Afther Freddie past away on Nov 24th. 1991, the July 12th. full show was officially released on 2cd & 2lp, as well on DVD. In 2011, it was re-released on 2dvd (both shows) and 2cd (July 12th. show). 2. Is This The World We Created? “WEMBLEY STADIUM 1986” Wardour label released in 2012. 1986 Wembley · Stadium 2 Days of familiarity with the official professional shot and soundboard is now the audience recording … It is the title which made everyone touched a mania all over the world that everyone would have enclosed so high . Besides, it is the best sound quality. The release that recorded the sound source of the shock which I literally documented the other side of Wembley Stadium called a reputation and it became Sold Out at a speed exceeding the expectation of our shop. Even in concerts where there are still fulfilling items in official, the value as a document can not be faded if it is an audience recording of outstanding sound quality. It was an item that was not an overstatement even if it said that he did make such a problem raised. Magic tour which became the last shining days of Queen’s live history. Among them, the most glorious stage is Wembley 2 Days. It was that live aid that the band who I was thinking about even dissolving a year ago breathed back on the stage of less than 30 minutes on a single day. It was these two days that I went back to Wembley again after passing through the resurrection of angry that started from there. Although it was only one of the queen’s latest tours in 1986, as it was thought that a new tour would take place someday, the position of the magic tour changed to a very important thing due to the death of Freddie I have gone. From there the group lasted for five years, but it is certainly becoming the last live tour. As a result, Nebworth and Wembley two days have been promoted to handling as a particularly important stage even among magic tours. So it was an official series of items at Wembley Stadium that we upgraded over time. Among them, the item to be called the definitive version was released in 2011, and the legendary Wembley show is satisfactory if there is only it … It is “WEMBLEY STADIUM 1986” suddenly appeared in everyone thinking so. This item that shocked mania all over the world in every sense, but stands out from the audience recording on July 11th. As you can see from that picture, it is only when the live was done while the rain started falling (it was a happiness that did not rain heavy rain), the act itself of audience recording is courageous (Lol). In that situation, I thought that you captured with so much sound quality …. The sound quality is superb as it can be compared with the superb audience of the magic tour such as Berlin, Vienna and Nebworth which our shop has released so far. It captures both the enthusiasm of enthusiasm and the dynamism of playing in an ideal balance, and the degree of sound image turning on is perfect. And most of all, July 11, 1986 I breathed in a lot of the atmosphere feeling of Wembley ‘s atmosphere is exceptional. Of course the clearness of the performance is an official victory, but the sounds and the atmosphere of the place that the audiences who actually were in the stadium heard are exactly the sound sources of this one. That’s why the realistic feeling that is transmitted. The fun of the call-and-response in “Another One Bites The Dust”, followed by Freddie’s “There are many rumors fluttering but Queen is not broken, so the response of the audience such as relief to remarks comes out of the stage The surprising clearness that is recorded without blocking the sound. Let’s assert that this is the true point of audience recording. In addition, the appearance of this sound source shortened the ending of “Guitar Solo”, and furthermore the mistake of “Love Of My Life” was corrected, and it turned out that some work was added in the scene of Brian involvement, also called audience recording Facts that could be proved because it is a document as it is. Meanwhile, July 12th was a surprising quality that delivered a big topic even when “WEMBLEY STADIUM 1986” was released. This is a terrible thing with plenty of soundboard feeling anymore. At that time, did the staff in the mixing area set up a microphone and recorded it? The more speculation that was born, the audience recording of a different quality. It is a real sound image that is too turned on, and clearing from the speaker at a loud volume will clearly be an illusion that “PA bout soundboard?” However, it is totally different from the well-balanced official balance, and this is no different than a superb recording that will entertain us from another angle on Wembley’s second day, which is also familiar. And in this recurrence, equalize the official sound board on both sides on both sides and adjust without discomfort. 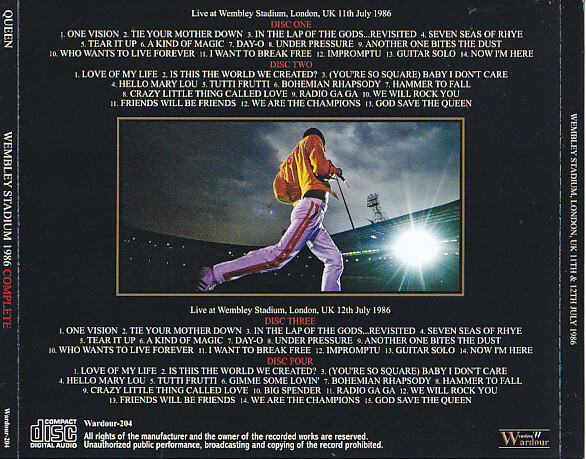 Especially due to the reality of tape change, the cut is occurring at the end of “Impromptu” part and “Crazy Little Thing Called Love” on both days, but since it is a place where songs of Freddie do not enter it strangely, audience and sound board I can not see a sense of incongruity at all in the hybrid state. At the same time also realizing the excellent quality of the audience recording of this time At the same time, it is amazed also at the vividness of the tape exchange timing as if I knew the development of live. Another side request of re-releasing from Mania, side side of Wembley, passed through Sold Out from 2012 release. There is nothing as worthy as timing about 2016 as its 30th anniversary from the magic tour to its resurrection!